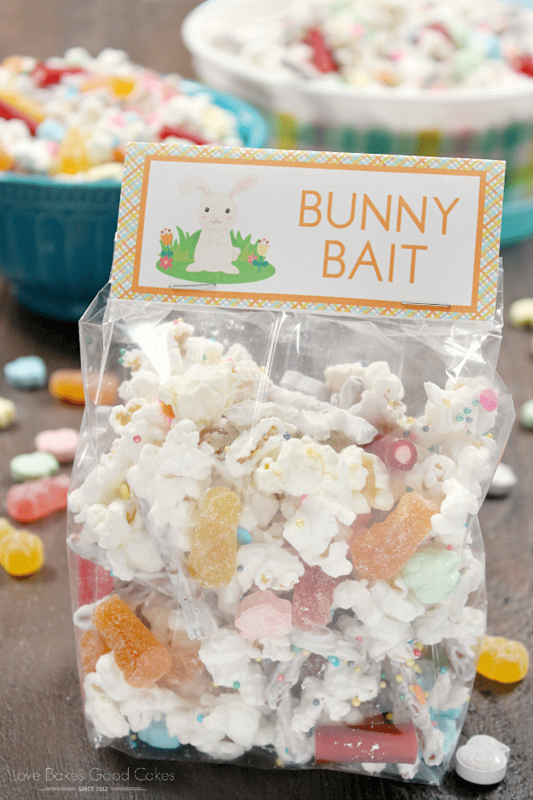 Bunny Bait is candy-coated popcorn, cereal, and pretzel sticks mixed with plenty of sprinkles and Easter candy. 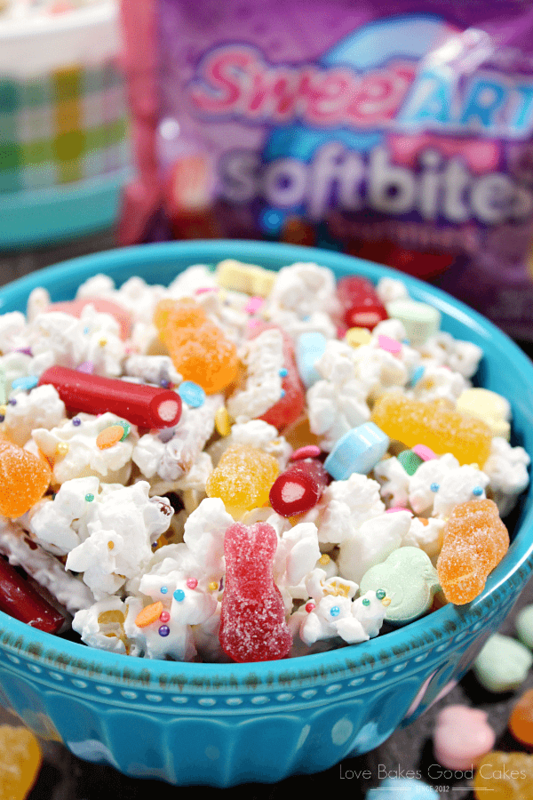 Great for treat bags, Easter baskets, movie night, or general snacking! I’m kind of a nerd when it comes to holidays. Not only do I like to talk to my kids about our family’s traditions and why we do what we do to celebrate, but I usually try to do something extra special in addition to what we normally do. Sometimes, it’s as simple as decorating gingerbread men at Christmas … or making a fun new red, white, and blue dessert for the 4th of July. A couple of weeks ago, I was talking to the kids about Easter. After our conversation, I thought it would be fun to find a few Easter-themed movies to watch and create some sort of fun treat to go along with it. What’s a movie without snacks? The kids suggested making a snack mix with some of our favorite Easter candy and I picked the popcorn, cereal, and pretzel combination to go along with it. 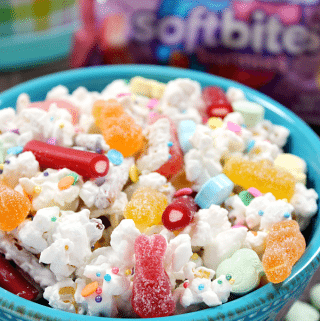 SweeTARTS Soft Bites Bunnies, Sour Bunny Gummies, Chicks, Ducks & Bunnies, and Soft & Chewy Ropes are the perfect addition to any springtime recipes and they can be found at major retailers nationwide. I’ve included them in this Bunny Bait recipe, but they’re also ideal for stuffing Easter eggs for a sweet reward! I love that the SweeTARTS Soft Bites Bunnies, Sour Bunny Gummies, and Soft & Chewy Ropes contain no artificial flavors or colors. 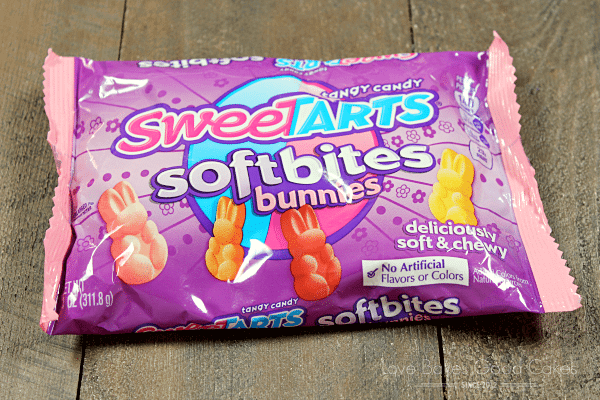 In particular, I really like the SweeTARTS Soft Bites Bunnies because the jelly gummies have a surprisingly soft texture with a cute bunny shape! They come in an assortment of classic flavors with a unique melt away smoothness. My kiddos LOVE the SweeTARTS Soft & Chewy Ropes (a dazzling blend of chewy cherry, licorice-style rope with a fruit punch filling) and the Chicks, Ducks & Bunnies (not only delicious but ideal for stuffing Easter eggs). I’ve included all of our SweeTARTS favorites in this Bunny Bait and you can be sure that they’ll be in this year’s Easter baskets as well! The kids enjoyed this Bunny Bait so much that we will be making treat bags to share with our neighbors. 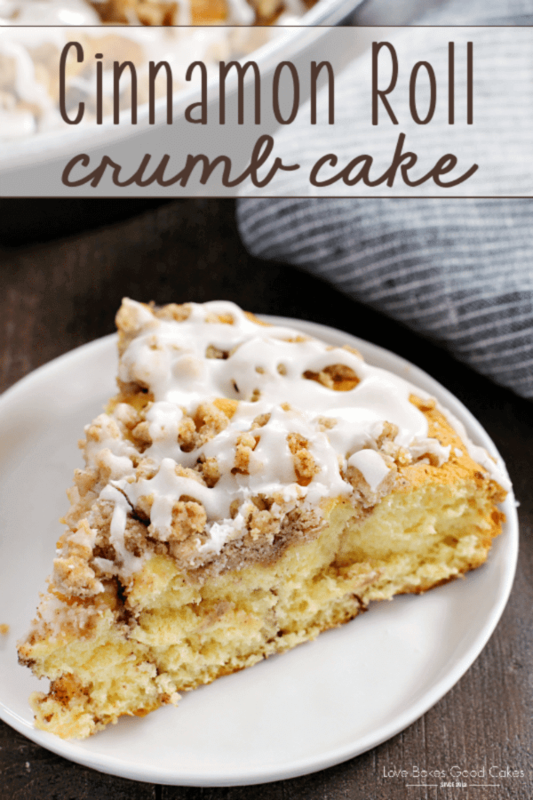 This makes a great classroom treat too! For SweeTARTS news and special offers, follow them on Facebook, Twitter or Instagram. 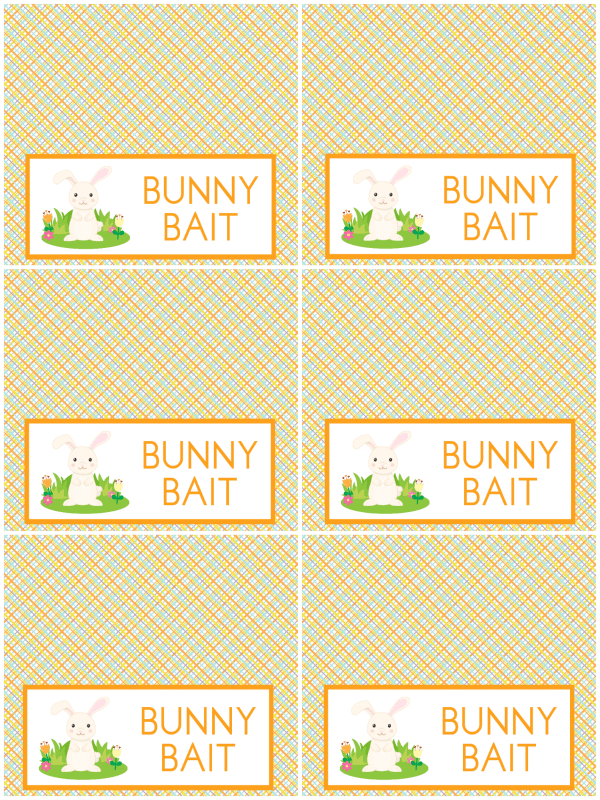 I’ve also included a free printable should you want to make treat bags for your Bunny Bait! Feel free to download the image for your own personal use – You may not claim the image as your own, re-sell, or redistribute it. Click on the image below to be taken to the download page. Place the popcorn, cereal, and pretzel sticks in a large bowl. Set aside. Melt the candy melts according to package directions. 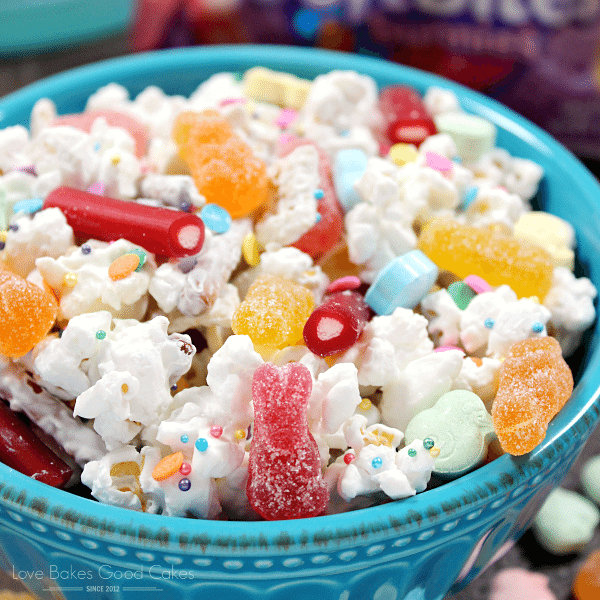 Pour the melted candy over the popcorn mixture and mix until all pieces are well coated. Pour the popcorn mixture evenly out onto the baking sheet. Immediately top with sprinkles. Allow melted candy coating to harden. Once the candy coating has rehardened, break the popcorn, cereal, and pretzel pieces apart. 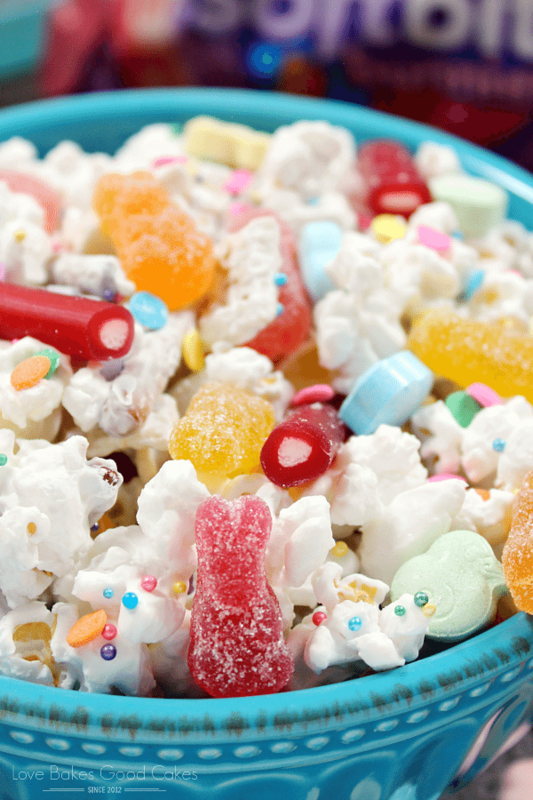 Mix in the SweeTARTS Soft Bites Bunnies, Chicks, Ducks & Bunnies, and SweeTARTS Soft & Chewy Ropes. If desired, Bunny Bait can be packaged into treat bags or transferred to a serving bowl. Store covered at room temperature. 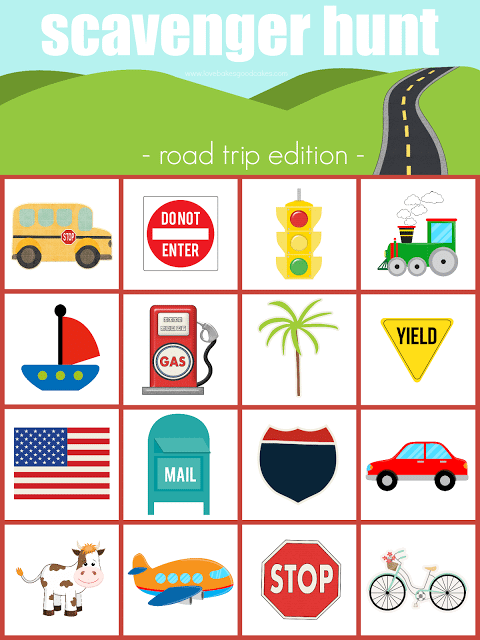 What a super fun Easter treat! I already know I'll find it quite addictive! Am going to make these for sure!! Thanks too for the printable. So Jamie help out this silly person and tell me exactly what is roasted rice cereal?? You don't mean rice krispies do you?? Could you give me a hint?? Love all your awesome stuff!! Not silly at all! 🙂 I used Rice Chex cereal. I hope that helps and I hope you enjoy the Bunny Bait!! Thanks Jamie, I made it before I got your message and did use rice krispies. Turned out yum yum yum@@ Next time I'll follow directions! !